Portner & Shure was amazing with dealing with my auto case. My wife and I were in a car accident and they came highly recommended. We worked with Christine Airey and she was able to coordinate all of the necessary information while we focused on getting better. She kept us updated with all communication and made the process of settlement a breeze. Christine showed outstanding sensitivity and care during our time of distress and helped us to get past an unfortunate event. 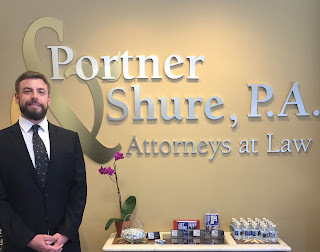 I would recommend Portner & Shure to any and everybody who has any legal needs. This case was handled by our Paralegal, Christine Airey, who works out of our Columbia, MD office. Labels: "accident attorney in maryland", "accident injury lawyers", "accident lawyer in maryland", "Auto Accident Lawyer", "automobile accident claims", "Greenbelt Maryland personal injury lawyer"
Join us in welcoming one of our newest attorneys, Justin Weiss. Mr. Weiss received his undergraduate degree in Psychology from Boston College in 2006. Before attending George Mason University School of Law, he worked on Capitol Hill for two Democratic members of the House of Representatives. He was admitted to the Virginia State Bar in 2012 and the Maryland State Bar in 2017. At Portner & Shure, he practices traffic/criminal defense and personal injury law, including automobile accidents. Mr. Weiss has protected the rights of individuals accused of crimes and traffic offenses and successfully represented clients in a variety of civil matters. Mr. Weiss communicates regularly with his clients to help solve their legal issues. Before entering the courtroom, he thoroughly prepares his clients, so there are rarely any surprises. Mr. Weiss is a passionate and persuasive advocate with trial experience in courts throughout Maryland and Virginia. Labels: "accident attorney in maryland", "accident injury lawyers", "accident lawyer in maryland", "accident related injury", "Auto Accident Attorney Maryland", "Maryland personal injury lawyer"
Recently, Portner & Shure settled a case where two of our clients were rear-ended, leaving them both in immense pain. In an effort to treat their injuries they presented themselves to a hospital and followed discharge instructions to be seen by a chiropractor to ease the rest of their pain. After following their doctor’s treatment plan they were discharged and left with medical bills equaling over $6,000.00 each. After extensive negotiations with the liable insurance company, it was clear they were not willing to offer the settlement amount our clients deserved. Before going to court we were given offers of $7,700.00 and $6,600.00 to settle our client’s claims. However, after going to court we received the verdict of $15,000.00 for one, and $10,586.00 for the other. Needless to say, our clients were very happy with their court award. Labels: "accident attorney in maryland", "accident injury lawyers", "accident lawyer in maryland", "accident lawyer", "accident news", "Auto Accident Lawyer", "Maryland personal injury lawyer"
This month in litigation news at Portner & Shure, our attorneys have realized that during settlement negations with Allstate, the insurance company believes they have the right to audit medical bills. When Allstate has medical bills audited they make major cuts to the total cost and make offers based on their reductions, even though our clients are still stuck with the full bill. Because of this, we have found that the insurance company generally loses in the court room due to the fact the judge feels as though the reductions are excessive. Our clients fighting against Allstate have been extremely satisfied with their settlement offers after going to court and getting the compensation they deserve from their accident. Labels: "accident attorney in maryland", "accident injury lawyers", "accident lawyer in maryland", "Auto Accident Attorney Maryland", "Auto Accident Attorney"